What is Pocket? Why am I seeing Pocket Recommendations on my new tab page? Pocket is a part of the Mozilla family, like Firefox. Pocket makes it easy to discover high quality content that’s worthy of your attention and to save content so you can return to it when you have the time. Pocket and Mozilla both share a passion for protecting the openness of the web and creating a content platform built around trust and privacy. That’s why we worked with Firefox to put Pocket Recommendations on your new tab page. These recommendations give you direct access to the best content on the web, curated by Pocket’s 30+ million users. How does Pocket make Recommendations? Please note: Personalized Recommendations are still being tested and aren’t enabled for everyone. If you’re not in the test group, recommendations on your new tab will come from a general list of the best of stories on the web. Pocket Recommendations are personalized just for you and are based on your browsing behavior in Firefox. 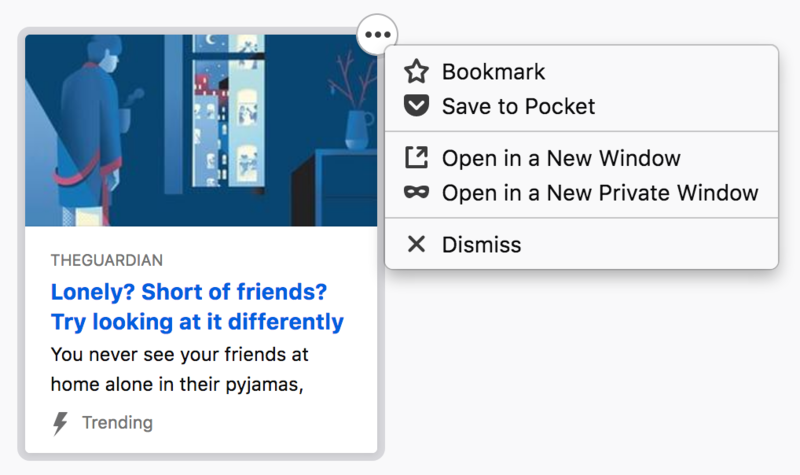 If the “Recommended by Pocket” feature is enabled, Pocket will send a list of the best stories on the web to Firefox every day. With each story, Pocket also sends a list of related websites that, when visited, signal likely interest in the story. Your Firefox browser compares your browsing history with the list of related websites to sort and filter through each day’s stories and recommend the ones that are most likely to interest you. Okay, so you don’t collect my browser history. What information is collected, and what control do I have over what’s shared? When you use Firefox, Mozilla by default collects technical and interaction data. You can read about the data we collect and how you can choose what you share in the Firefox Privacy Notice. 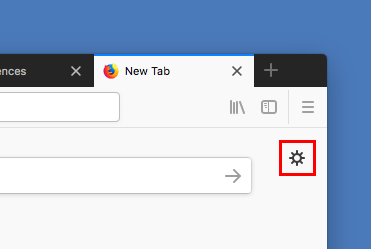 If your Firefox is configured to share this technical and interaction data with Mozilla, when Recommendations from Pocket are displayed on your new tab, we collect information about how many times they appear and whether or not you interact with them. However, this information is not associated with any of the other technical and interaction information about you or your copy of Firefox. Learn more about the data we collect. If I opt out of data collection, can I still see personalized recommendations from Pocket? Yes! Because our personalization works without sending your data to Mozilla or Pocket, Pocket stories will still be personalized even if you opt out of data collection in Firefox preferences. I don’t like a specific Pocket recommendation. What should I do? If you don’t like an article that was recommended by Pocket, you can dismiss it from the menu that appears when you select the ●●● button at the top right corner of the tile. If you are sharing Technical and Interaction data with Mozilla, then this will also help Pocket improve our recommendations. Can I hide all Pocket Recommendations on my new tab? I’ve noticed that some recommendations have a “Sponsored” label. How are these different from other recommendations? From time to time, the occasional sponsored story may appear as a recommendation from Pocket. These stories will always be clearly marked, and you have control over whether they’re shown on your new tab page. Your privacy is of the utmost important to us. The same data policies outlined above apply to sponsored recommendations in the same way. Except for an aggregated total count of impressions and clicks that a particular item receives, sponsors do not receive any additional data from Pocket or Mozilla. Uncheck “Show Sponsored Stories”. Note: If you do not see this checkbox, you have not been included in our sponsored stories experiment and they will not appear in your new tab. Are Recommendations from Pocket available in my country? Pocket Recommendations are available for users located in the United States, Canada, and Germany. If you’re interested in seeing recommendations in your country, please let us know!